Tuesday, December 7, 2004 As I posted earlier, the kittens had their fixit surgeries yesterday. All went well and I was to pick them up this morning. Joey also had an umbilical hernia taken care of, so all three got to spend the night at the vet’s office. This morning when I was taking my shower, I heard the phone ringing. It was before nine, so I got out of the shower to answer it, but was too late. I checked caller ID and it was the vet. This couldn’t be good. I called them and they put the vet on the phone. This is really not good. He told me that Phoebe eviscerated (she pulled out her stitches, the pulled out about four to five inches of her intestines) herself sometime during the night. He said it hadn’t been too long, because her intestines were still pink and viable, nothing horrible had set in. He cleaned them off, put them back in and sewed her back up. She was on fluids and antibiotics and most likely can come home tomorrow. With an e-collar. And she’ll be crated. After all these years of getting cats spayed, this was a first for me. He said she’ll be okay, she’s not in any danger of dying from this, but we’ll have to keep a close watch on her. He said the main problem would be peritonitis, but he said she looks pretty good, he doesn’t think this will be a problem. It would have been worse if it was the bowels, but, it wasn’t. Damn. Wednesday, December 8, 2004 The gang’s all here! Phoebe is home from the vet’s and doing well. She’s very glad to be home, purring up a storm and saying ‘hi’ to all of the other cats. Of course, they aren’t all as pleased as she, because she smells weird and has that collar on, which looks a little strange. I’ve got some pictures up over at the family album of the kittens. Luckily, she doesn’t need to be crated. Although I will have to keep an eye on her and the collar. She had it part of the way off earlier today. I don’t think it was on purpose, though, but by accident. I think some kitty was laying on it when Phoebe woke up from a nap and when she got up, it pulled over one ear. Crap. She got it off. I was in the garage and she followed me out there. I went back into the house and saw two kittens playing in the hallway. Then a third joined them. None of them had a collar on. I called the vet’s office and they suggested we go get her a smaller one. The one she has on, the smallest setting is seven and a half inches, her neck is six inches. And when I found her after I found the collar, she was licking her belly. Not a good thing to see. So, Brian just got home and had to go back out, down to the store to find a smaller collar. I can’t seem to concentrate on this right now, I’ll post more later. Friday, December 10, 2004 Gotta go watch Phoebe, I took the collar off of her this morning so she could do a little grooming. She also spent quite a while at the feedbag. I have to make sure she’s not pulling on her stitches, though. I did get something online done yesterday, you can see it here——> Season’s Greetings. Clicking on the pictures will give you a name and take you to that cat’s webpage. More later. I hope. My right hand is hurting and typing is uncomfortable. Sunday, December 12, 2004 It’s pretty quiet around here today. Nice. I started dinner early, we’re having spaghetti (I make my own sauce). Brian and I are both websurfing. He was in a bad mood from the get go this morning. I said something to him about it and he knows he’s crabby, just doesn’t know why. It’s been a pleasant weekend, yesterday was warmer than today. He got a ton of stuff done yesterday, washed and waxed the Ranger and the Escape and mowed the lawns. This morning, he cut a bunch of wood up, so we’ll have wood when the weather permits (you don’t really want a fire when the temperature is in the mid to high seventies). So, we’re sitting here surfing, the doors and windows are open. I’m in sweatpants and a teeshirt, he’s got on Levis and a shirt with a flannel shirt over it. He asks me “isn’t that breeze cold?” when the breeze comes in through the window. It dawns on me why he’s crabby. He’s getting sick. He’s been fighting a cold since before we went to Disneyland back in October. Thinking about it, he went to bed last night before eight. Phoebe hasn’t had the collar on since Friday night. I took it off of her Friday morning and left it off until it was close to bedtime for us. With Brian’s help, I got it back on her, but it was a little looser than earlier. And she had it off within the half hour. Brian had already gone to bed. I tried getting it back on her alone, but I couldn’t so I left it off. It hasn’t been on since and she’s doing fine, she hasn’t bothered her stitches at all. And she’s a lot happier with it off. Annie is losing weight. And she seems to be drinking a lot, but then, she’s always done that. So, I’ll be taking her in to get a geriatric work up. Annie is DeeJay’s sister, they’ll both be seventeen next year. She’s had problems in the past with a pretty bad, ongoing bladder infection. She was on Elavil for quite a while, hasn’t been on it in some time (knock on wood). We’ve also got another cold going through the population. Georgie was the first, then Ciara started sneezing, then I heard Lonee and even Chandler. The thing that gets me with Chandler is the vet said he should be vaccinated, just in case, so he doesn’t catch that herpes virus that lives here. Heh. And now, he’s sneezing. Way to go. One of the kittens discovered the joy of shredding toilet paper last night. Lovely. We put the toilet paper on so it rolls from the back and the mess wasn’t that bad. I must admit, shredded toilet paper is preferable to shredded wallpaper. Well, can’t think of anything else right now. Going to go finish getting dinner ready. The topic: Well, something new…. Thursday, December 23, 2004 Here’s a little update. I caught Potter cleaning himself more than normally the past few days. Yesterday morning, I started him on amoxicillan. Last night, I saw him straining in the litter box. And I saw this again this morning. Brian pointed out some very bloody urine in his shower. I didn’t think that was from Potter and I started thinking about the other cats. Marco seems to have been cleaning himself, too, but it’s really hard to know for sure. Something I just have to watch closely. Anyway, after seeing him this morning, I mentioned it to Brian and he said best to get Potter in to the vet today, so it wouldn’t be something we had to worry about over the weekend. I called and they could fit me in at ten this morning. We go in and Potter cried like a baby the entire way over. And once there, we had a fairly short wait in the waiting room and then we went into the examining room. Potter weighed in at ten pounds, then we sat and waited for the vet. I put Potter back in the carrier and sat next to him. I put my elbow on his carrier, my head in my hand and closed my eyes. I almost fell asleep (I’ve been so very tired these past few months, with Marco and his accident, Little Bit and the kittens, all getting acclimated to new situations, the kittens getting fixed, Phoebe’s little incident with her spay stitches….) when the vet walked in. Now, when I took Potter out to be weighed, I saw blood in the carrier and there was also blood on his tail. I was pretty sure at this point where the stuff in the shower came from. The vet checked him over and prescribed Metacam for five days, ammonil, just in case he has crystals and to keep him on the amoxicillan for a week. He said he should be feeling better by tomorrow. I started Rachel on flagyl for her runs. It’s only been a couple of days, but I think it’s working. We’ve had some really pleasant days this week and I started keeping the doors open during the day. The kittens come in and out as they like and even Little Bit is venturing out without slinking low to the ground and running from spot to spot. She’s walking through the yard, taking her time to stretch out from time to time. I’ve even seen her just laying on the patio, soaking in the sun. The kittens are getting lanky. I hope this means they’ll be bigger than Rachel and Ross. Ross is without a doubt, the smallest male I’ve ever seen. Well, he does have a belly on him, but he’s short. I’d really like to see some bigger cats here. Speaking of bigger cats, Opie is getting huge. Not fat huge, but he’s gonna be a big, big cat. And he’s such a love bug. He does seem to be mellowing out, which is a good thing. I’d like to see Angel come back into the house. And I’d love to see Autumn use a litter box. She spends the majority of her time in the garage, but she does come in to go under the sofa or loveseat in the family room and poop and pee. I clean this up at least once a day. This morning, I couldn’t reach it and Brian had to lift the loveseat up so that I could get under it. She’d pooped right against the metal at the back and peed at the front. This was really annoying because yesterday, I’d washed the floor in there, pulled everything I could out from the wall and cleaned under it. I had tried putting a bowl of vinegar under there to keep her away, but she just moved where she went, making it harder for me to access. I got called to report to the jury room in January. The last time I went, I came home and we took Pepper to the vet and she was put to sleep. Great memory. Well, got stuff to do. Like maybe take a nap. I wish. We didn’t have any health problems that couldn’t be treated. Back in January, we had a pretty bad cold go through the population. The cats got it from a feral who somehow got into our backyard. This was back when Little Bit was in heat and the boys in the hood were hanging around, trying to get a little from her. Ciara was diagnosed with IBD back in February. Her stool was so bad that very runny feces just poured out of her, even when she was laying down. It took a few tests to figure it out, but a diagnoses was made and she recovered (although she got pretty sick and had lost quite a bit of weight.) She’ll likely be on prednisone for life. One of the side effects of continued use of prednisone, a steroid, is a depressed immune system. Of course, she was hit hard by the cold that was here. She’s never quite gotten over it, still has sniffles and sneezing. In April, Little Bit gave birth to five kittens under our bedroom window. I was able to get the kittens one Saturday morning and three went up to Los Angeles to be socialized and adopted out. At the end of May, Richie started getting out of the yard. It was extremely frustrating for us, because we couldn’t see how he was doing it. Brian readjusted the fencing here and modified it a bit there, adding more as he went along, but Richie kept getting out. I finally saw him run up the plum tree and start to make a move over to the top of the shop roof. As soon as Brian got home, I let him know where the problem was and he did a considerable amount of pruning of the tree. And Richie stayed in the yard. We tried for months to trap Little Bit before she got pregnant again. We put out soft food, we put out people tuna, we baited the trap with fresh KFC chicken, with no luck. We caught the same possom three times, the last time it was so scary looking in the trap (I thought it had died), that we didn’t set the trap up again overnight. It would be set in the evening, then we’d set it off before we went to bed. Needless to say, Little Bit got pregnant. In August, almost four months to the day of her previous litter, she once again gave birth. August was a fairly busy month for us. Along with trying to find Little Bit’s kittens (she took them elsewhere after having them on the bank and that elsewhere was not in our yard), Marco ended up with a broken leg. He had surgery and was crated for eight weeks. He’s healed up nicely, gotten quite a bit of his muscle tone back. I was a little worried yesterday, he tried to get up into the window in the bedroom and had a hard time pulling himself up when he didn’t quite make it. But he did finally get in the window. I’d have helped him if I’d been there, and it happened to quickly for Brian to do anything (his reflexes don’t seem quite as quick as mine do at times). Of course, I haven’t spoken to the neighbor since and this is the first time in years that she didn’t bring over any baked Christmas goodies. Not that I care, they usually end up in the trash. Honestly, I’m surprised that she’s brought them over as long as she has. The week before 9/11, Little Bit brought her kittens up and had them under the car. They weren’t as eager to eat from plates I put out as the previous litter was. These guys were a whole lot more wary of this human than their older siblings had been. I realized that if I didn’t get them soon (as in days) it might be very well too late to socialize them with humans (think “Jackson”, who still isn’t fixed because neither of us has the nerve to grab him and put him in a carrier) and if they were ever going to go to a good home, it was imperative I get them quickly. And on Saturday, 9/11, that’s exactly what I did. On 9/12, Brian made the decision that we’d keep the kittens, as well as their mother. As long as we could get her into the trap. I must admit, I had my doubts, but now, we had kittens to use as bait. The kittens didn’t work, but Brian’s little talk with her must have, because by three o’clock, Sunday afternoon, Little Bit went into the trap. Late September, I tried cleaning the sofa and loveseat in the living room, to try to get them presentable for when the catsitter came to stay. They were so bad, I ended up telling Brian I wanted them out of here and I called and made arrangements for the trash to get them the following week. I’d tried for years to keep them clean (the problem was the cats urinating on them), using pee pads under the sofa covers, but everything I tried failed miserably. We’d discussed not having anything out there for us to sit on, we rarely used that room anyway. So, Brian hauled the furniture out, I washed the cement floor (the carpet was removed a few years ago) and we started putting cat furniture in it. Now, it’s a cat room. Well, I was finally able to get a rocking chair I’ve wanted for so long. It’s comfy and cozy, a nice place to just relax and watch the goings on in the backyard. And the cats don’t seem to mind it either. Sadly, a few weeks after we trapped her and brought Little Bit in, SpotTee, a neighborhood feral who’d been around for a while, disappeared. We felt really bad for KittyMeeze, who’s lived in front of our house for years now. He was all alone. We really want him to come inside, but we don’t know how we’re going to get him in. Little Bit’s mom, Carla started coming over again (Little Bit always used to chase her away) and KittyMeeze was beside himself with joy. It broke my heart to see him running and jumping and so happy to see another cat. Not that he was happy, but that he was so sad here by himself. And he left. He went away for a couple of weeks and I was very worried about him. But, he came back, I would think because this is a very safe place for cats, since the entry way has a gate on it and it would be difficult for anything to get to him. Yes, he was back, but he was afraid of us. We’d sure like to know what happened while he was gone. He’s more afraid of Brian, he’s almost back to normal with me. After our yearly October vacation to Disneyland, we returned to find Little Bit out of the yard. It seems she’d snuck past the petsitter when she opened the door to take the very vocal Potter out (the cats stay in when we’re gone for any length of time). And once she got into the backyard, she knew exactly how to get out. It took Brian and me hours to get her back in, but she was back in the yard, in the house, safe and warm by late evening (it had started to rain on Saturday and didn’t let up until mid-week). And the next day, I saw another cat in the yard. That was Chandler. We don’t know how he got here, but we think he picked a grand place to live. He was out there in the rain and thunder, with no food. His first weeks here were spent under the sofa in the family room or under the bed, but little by little he’s loosened up. Now, he spends most of his time on a cat tree in the living room and if the doors are open, he’ll go into the backyard and check out the catnip garden, taking the occasional snooze back there. He runs from me outside, which I’m working on. Time and patience is what is needed with so many of these cats. Then on the 6th of December, it was time for the kittens to get fixed. Little Bit had been fixed the day after we trapped her, but the kittens had to be at least four months old for my vet to fix them. And since their four month birthday fell on a Friday, I made the appointment for the following Monday. Phoebe and Monica would be spayed, Joey would be neutered and also have an umbilical hernia taken care of. The surgeries went well, what didn’t go well was the recovery. Joey and Monica did nicely, but Phoebe pulled out her stitches and four to five inches of her intestines. She didn’t do any permanent damage to herself, but she had to stay an extra day and also got to wear an e-collar, which she hated (and the other cats weren’t really pleased with it, either). Now, life seems to be running pretty smoothly. DeeJay gets his fluids every night between eight and nine, along with a quarter of Pepcid A/C (regular strength) to help with his CRF (the Pepcid helps calm his tummy). He’s still maintaining his weight gain of this year, almost a half of a pound. His stools are much, much better, better than ever since he had most of his colon removed five years ago (December 1999). His back legs hurt him, I wouldn’t doubt he has a little arthritis, so he can’t jump as well as he used to. But he likes to eat, begs for food, demands attention and loves to sleep in the warm sun. There were times this year I thought for sure he wouldn’t be with us much longer, so I thank God for every extra day we have with him. All the new cats seem to be settling in nicely. There is the occasional spat, but it’s not too bad, rarely is there much fur. Autumn lets me know she’s still around by pooping and peeing under the sofa and loveseat in the family room. Lonee and Red now spend most of their time in the house. Brian even remarked that Lonee actually came up to him in the kitchen, wanting to be petted (she likes to hang out on the counter in the evening). We did have a little cold going through, Chandler and Georgie both seemed to have gotten the worst of it, sneezing out little bits of blood, but that’s almost over. It looks like the year will end on a smoother note than it started. And this coming Sunday, be sure to visit the Carnival of the Cats, a collection of blogs all about our favorite critters. The topic: Vote for the cathouse! 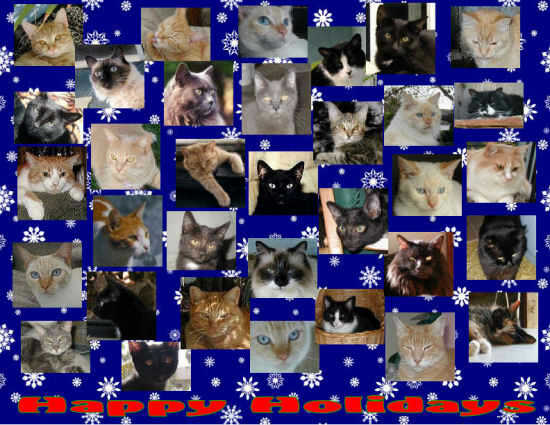 Monday, December 27, 2004 Okay, I entered some of the cats into a contest. Well, I don’t usually enter contests because I can’t stand competition and the thought of losing. So, here I am, begging for votes. Laurence is rotating the gallery pages so that the same six cats aren’t the first ones people see when they access the page. Vote for any of the six cathouse pictures on that page. A vote for one is a vote for all! And, you can vote once a day! Gah, I wish I’d never entered. Potter seems to be doing better. He did pee on the towel in the laundry room yesterday and there was still quite a bit of blood in it, but he hasn’t been peeing in Brian’s shower and there’s more volume when he does go. And I haven’t seen him straining since Thursday night. I’ll feel a lot better, though, once there’s no more blood. I can’t believe how quickly these cats forgot how to go out the cat door. They’ll stand at the sliding door and cry. I’ll pick the cat up, take him or her into the garage and put them at the cat door, gently bumping their head into it, so that it opens slightly. Boy, I’ll be glad when they all know how to use it. This morning, Little Bit decided she wanted out and started crying around 4:15 to go out. It’s too early! And I hate leaving doors open when the heat is on. Speaking of having the heat on, we’re supposed to be getting some substantial rain the next few days. That will be nice. It would be nicer if KittyMeeze wasn’t outside. We haven’t seen Carla in days. And this morning, after I got back to sleep after opening doors for cats, I could swear the yipping of a coyote woke me up. It sounded like it was right in front of the house. I jumped out of bed, grabbed my robe, threw it on, ran out the side door and out the gate. Just in case KittyMeeze was in the entryway, I didn’t go out the front door. I didn’t see anything, but I stood out there for close to ten minutes looking up and down the street. Brian said he thought it sounded like a dog. I hope he was right. But it puts that much more pressure on getting Meeze in. I wish he’d go into a trap. Brian said something about getting him in the same way we got Red in. That would work if we could get all of the cats out of the garage (Gracie, Autumn, and Angel for sure). Brian wanted to look at the Christmas lights, so we went out after dinner last night. I think quite a few people already have turned them off or taken down the decorations, because there weren’t all that many. Of course, I kind of lost interest in the sightseeing after we saw a dead young black cat in the middle of the first road we went up. It was in front of a house that always has way too many kittens hanging around. I’m really tempted to send them spay/neuter information. The next time we go up that street, I’ll get their address and have some literature sent to them. If the cars don’t get their cats, the coyotes will. And they probably don’t even care. They’re “just cats” after all. There are little spots of blood all over the living room floor by where Chandler sleeps. He caught this cold a couple of weeks ago and he went crazy sneezing. Many of you might know I’m not big on vaccinations, but the vet talked me into vaccinating Chandler because he might catch something from our cats (read that “herpes virus” that was brought into the general population by NotWally last January). He’s better now, but it was pretty bad for a couple of days. Chandler is getting so cool. This weekend, he was playing with toys all over the house. I remember the first time I showed him a fur mouse, he tried to eat it, thinking it was food. He’s acclimated well. And he doesn’t flinch as much when we reach down to pet him. I feel so badly for him, for how he must have been treated before he came here. The kittens have discovered the kitchen counter. Brian was talking to one of them this morning, telling the kitten it was okay to explore. I think it was Joey. They must be teething. Friday, all three were under the weather, sleeping all day, not moving much. 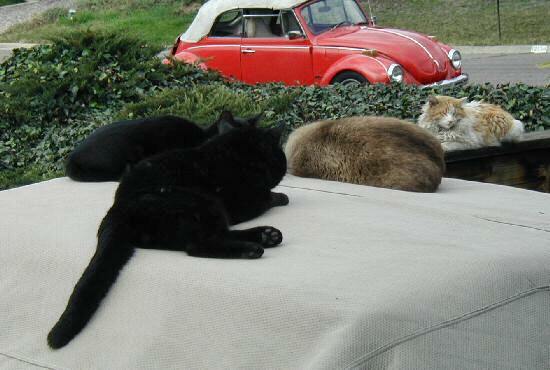 I had let them out in the morning and when I got up, two were outside and one was in the house, not moving much. But yesterday, they were back to normal, tearing through the house last night, up and down cat trees, getting into races with the other cats. It’s pretty fun to watch. Very entertaining. Except when Joey hit the blinds to get to the water bowl. That startled most of the cats and there was a big scatter. One jumps, the others figure there must be a reason to jump, so they jump, too. Silly things. My only problem with this is someone gets hurt during the ensuing melee. Well, that’s about it for now. Hope you all had a great holiday and are keeping dry and warm. Thursday, December 30, 2004 I’m worried about Annie. She hasn’t really seemed like she didn’t feel good, although the past couple of mornings I’ve found that she’d thrown up sometime during the night. Yesterday morning, there was a little wad of fur in the vomit, so I figured that’s why she’d been puking. She had a hairball she needed to get rid of. But this morning, there was some runny puke and I watched as she went over to the water bowl and just sat there and stared at it. This is cause for concern, as any observant cat owner knows. I took her temperature (using one of these), it was 103?, a little on the high side. I tested her for hydration (pinch up a skin on the back of the neck and if it doesn’t immediately spring back into place, but stays up in a little tent, there’s some dehydration going on). She shows some dehydration. I gave her an amoxicillan pill, a quarter of a Pepcid A/C (regular strength) and 120CC of subQ fluids. This was all around 6:30. She threw up the amoxi. I also brought her a little glass bowl of our bottled water. She lapped a little, but not very much. She’s been swallowing like she has a sore throat, which I could understand, with the cold that’s been going through our population. I took her temperature again about forty-five minutes ago and it had dropped two degrees, which is good. It’s been about two and a half hours since the fluids and medication and she’s just now napping. It looked like she was resisting going to sleep. I’d given her a clean towel, folded up a hand towel for under her head (she didn’t want to lay her head down for some reason, headache maybe?). Within the last thirty minutes I got another handtowel and placed it over her like a blanket and now she’s starting to nod off. I’ll be keeping a close eye on her all day, of course. It might be just a cold, like I mentioned. She eats from the same dish that I’ve seen Chandler at and I heard Chandler sneezing his fool head off over the food. And of course, cats don’t cover their mouths with their paws when they sneeze, so she might have gotten infected that way. She was fine yesterday, or so she seemed and the day before, she was on her towel in front of the monitor grooming herself. She’s always done this thing with her back claws where she pulls on them with her teeth to get the old sheath off. She did that Tuesday night and spit out the sheath. So, whatever hit her, hit her quick. She’s not a spring chicken any more, she’ll be seventeen next month. Like her brother DeeJay. So, keep a good thought for my old lady. DeeJay had some pretty nasty red urine last night. I don’t know what was up with him. But I started him back up on amoxicillan. He did take a nasty fall off of the desk the other night and I wonder if that has something to do with it. He’s better this morning, I didn’t find any signs of bloody urine this morning in the house. The kittens are doing well and recovering from whatever was ailing them. They’re back to chasing one another at night all through the house. They’re getting big enough now that they are having a harder time getting behind the entertainment center in the family room, which is a good thing. I hated the idea of them getting hung up in the cords in the back. I don’t know if it’s the cold damp weather or what, but a couple of the cats have become exceedingly affectionate. Like Sagwa and Lisa. I carry the claw trimmers with me so that I can trim the claws. They like to knead which actually feels good until the little tips of those claws start going into skin. Then it doesn’t feel so good. Well, I’ve got some work to do, actually got an order for the store the other day. I have to go fill it.